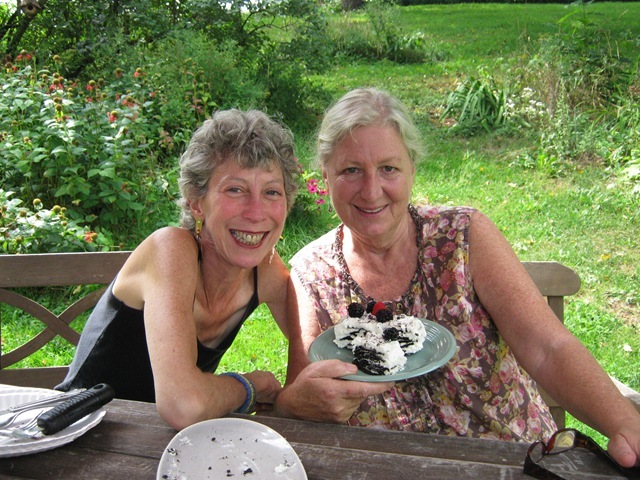 My sister, Janet, and I were born three years apart. We currently both have short, spiky salt-and-pepper hair and one or the other of us is often wearing silver wire-rimmed glasses. The other day a saleswoman asked if we were twins. Not only do we look nothing alike, but Janet is three years my senior, which I informed the woman through gritted teeth. Though not twins, we are best friends and have been so for as long as I can remember. 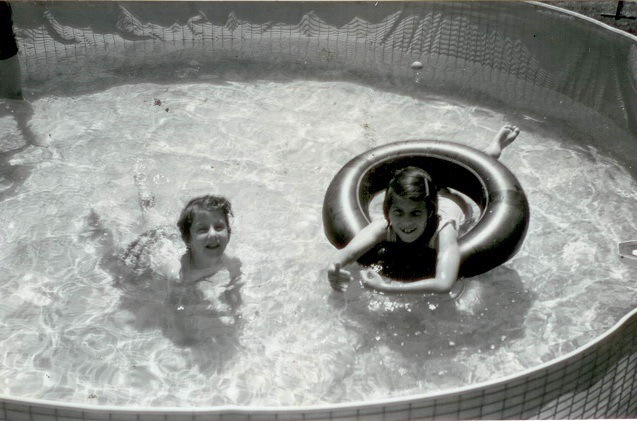 As children, we shared most everything: the books on the shelves of our diminutive maple bookcase; a bedroom; the three foot high swimming pool behind the back porch; snacks; bubble baths; and we shared the snow in the backyard in winter. Let me explain that last one. Upon awaking after a night of snowfall, we would run downstairs to the living room and gaze out at the perfect blanket of pure white glittering snow that covered the lawn. Awestruck, we would grab hands and nearly quake with excitement. After getting permission to play in the s now and pulling on all matter of shirts, sweaters, heavy pants, boots, jackets, hats, and mittens, we would step outside and stand, momentarily, on the patio while Janet explained the procedure. The plan was that we would divide the backyard in half. The side to the right was my snow and the side to the left constituted Janet’s portion of the white stuff. Upon arriving on a decision as to where exactly the middle of the yard was, my sister would draw an actual line with a stick or wooden spoon lifted from the kitchen and off we went. From that point on, I have no memory of what Janet did with herself, but I was off and running. 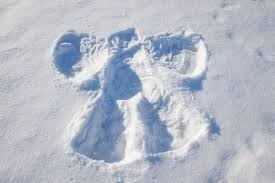 I threw myself down backwards and flapped my arms to create a snow angel. I dug my heels in deeply and walked around and around to produce a snow maze. I used the stick to make a tic tac toe board and played a round. Then I used the stick again to poke holes through the crusty top layer of snow; lots and lots of holes, like polka dots. Finally, exhausted, I looked to the left and there was my sister standing at the edge of the yard with her arms folded in front of her triumphantly. Her snow was pristine, virginal you might say. She might have padded around the exterior of her section of lawn, but not even the whole way. I’d mucked mine up but good. We walked into the house together and asked for hot cocoa. I was sopping wet head to toe. Janet hugged me and helped me remove my clothes. My mother thought it might be a good idea if we had a hot bath. “With bubbles?” I asked. “Sure, why not,” she said and led us upstairs to the bathroom. “I’m not a baby, mommy. I can do it,” Janet said, taking the bottle of Mr. Bubbles from my mother’s hand. “Not too hot,” my mother warned as she left the room. “Put extra,” I suggested, as Janet poured the shiny white liquid under the running water. When the bubbles were high in the tub, we climbed in. We were up to our necks in foamy bubbles. It was delightful. And what do you think my sister did next? “Those are your bubbles and these are mine,” she said, indicating the middle of the bathtub and gently pushing against the bubbles to form a thin space. 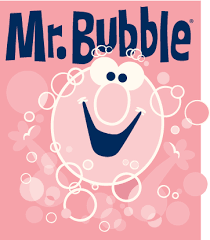 I closed my eyes and lifted a cupped handful of bubbles onto my chin and cheeks, patting it on like my dad did his shaving cream in the morning. “Put some on my head,” I instructed Janet, and she scooped some of my bubbles up and planted them on top of my head. I flapped my hands up and down, in and out of the water, and grabbed Janet’s toes with my own. I snatched up the last of my bubbles and put them on my mouth. I blew Janet a kiss. She blew one back and smiled. Directly under her chin and covering half of her body was a nice, fluffy cushion of bubbles. My side of the tub was now tepid water as still as a lake. As we grew older, we shared different sorts of things. We began to have friends in common; shared more meals in restaurants over the years than I can possibly remember; and, most beloved to us, we began to travel together. 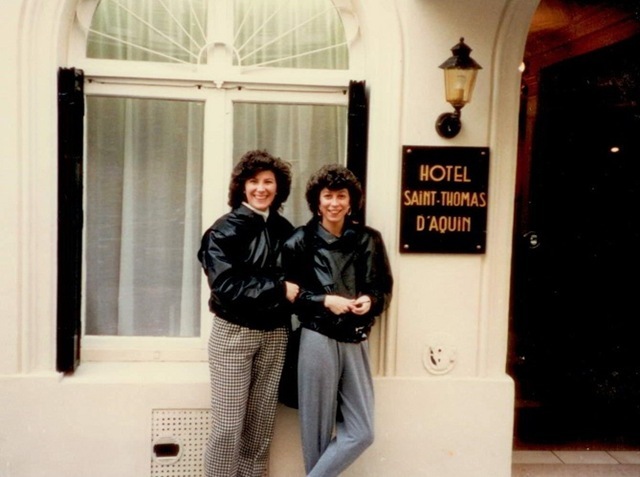 Janet’s first trip to Europe was with me and our destination, Paris, one we’ll never forget. 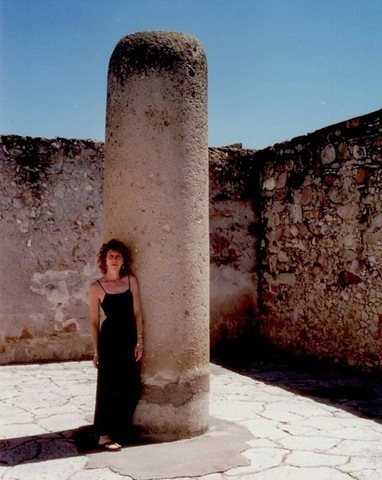 We have twice visited Mexico, Italy, and New Mexico, and traveled around the country, staying in lovely bed & breakfast establishments, exploring a handful of states together. 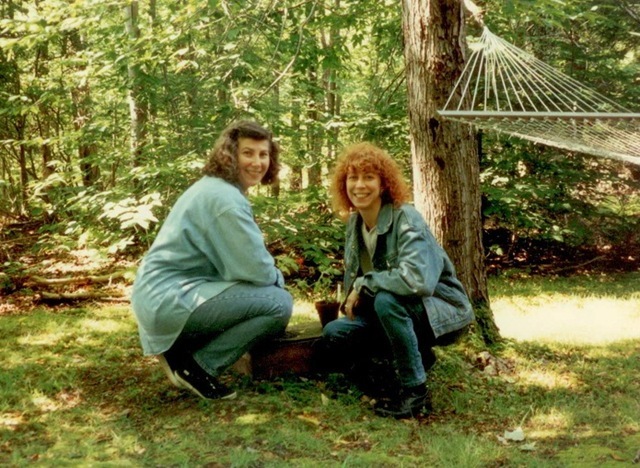 And then one summer, after repeated visits to friends who had moved upstate to the country, we decided to rent a weekend place in the Catskills. Naively, we looked in The New York Times and found a dump of a place that we paid way too much for and the owner, we later discovered, stayed there during the week – sleeping in the lumpy queen bed we shared in the tiny bedroom. Most likely, she used our towels to boot. But we had gotten the bug and fallen in love with Sullivan County. We sent out word that we were looking for a house to rent. 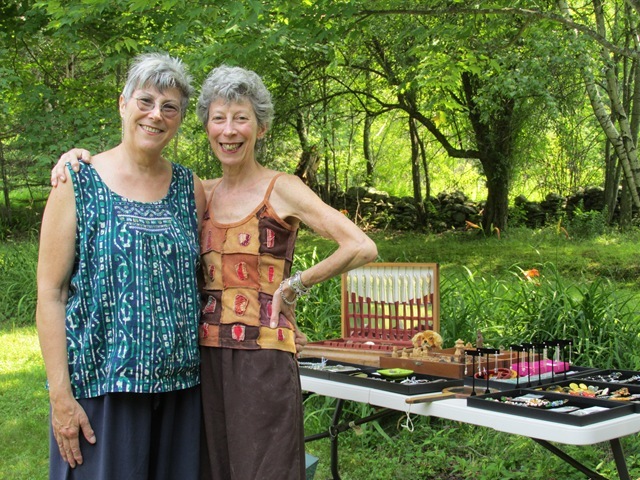 A coworker of Janet’s knew of a couple in Callicoon who were willing to rent to us for the summer for a reasonable sum. Eventually, we extended our stays until we were year-round renters. Finally, the people who owned the house met with us and said they were moving to the South. Would we like to buy the house? They didn’t even put in on the market. They knew we felt like we already owned it, anyway, and had made it our own. With help from our dad, we were able to make a down payment and have shared every weekend (except for a three-month hiatus in the winter) and vacations at the house since. When the house is closed, I spend weekends at Janet’s large and comfortable apartment in Queens rather than in my tiny Greenwich Village garret. So, for nearly twenty years we have marveled at how lucky we are to have a haven outside the city where we can spend time listening to the birds; lying in the hammock; eating our meals al fresco on the back porch in warm weather; sitting on the front porch with friends over cocktails; playing Scrabble and other word games; watching movies; and generally moving about the house together, but apart, as we go through our separate routines of variously making art, sewing quilts, cooking, or reading. We share and share alike, and just about my favorite aspect of that is when we eat out in restaurants. We never order our own appetizers or main courses, but rather, in general, we choose a bunch of small plates or if we do order a main it’s usually just one coupled with a selection of appetizers or sides that sound appealing. This way we get to experience a multitude of tastes. The saying, “variety is the spice of life,” is our mantra. During a recent meal at an unusual Japanese restaurant, an Izakaya (casual pub) called Riki (141 East 45th Street), we shared boiled spinach in sesame sauce; deliciously fatty salmon collar; an enormous pancake filled with scallions and bits of octopus; pan-fried udon noodles with pork and all sorts of interesting sauteed vegetables; and a skewer of grilled tuna belly. Soon after, we met, again, for lunch at the Village Taverna (81 University Place at 12 Street), a Greek place that specializes in grilling. We were served hot triangles of pita bread with a Mediterranean spread made of pureed roasted eggplant, garlic, fresh herbs and extra- virgin olive oil. 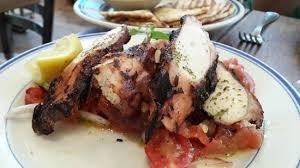 Then we split char-grilled octopus with capers, red onion, roasted peppers and sundried tomatoes and a huge salad of tomatoes, cucumbers, feta cheese, olives, and peppers topped with a handful of large, thin gyro (lamb roasted on a vertical spit) slices. Every dining experience is a feast of flavors shared by best friends, and in the end that is what I’ll remember. Not that I mauled my half of the snow-covered back yard or burst all of my bubbles. This is a simple and quickly prepared side dish perfect for any time of the year, but particularly now that zucchini is in such abundance. Preheat the oven to 425 degrees. Wash the zucchini, trim both ends, and cut in half lengthwise. With a melon-baller or teaspoon, scrape out seeds and some of the meat from the center, forming a groove down the length of the zucchini. In a bowl toss together the bread crumbs, grated cheese, parsley, thyme, and mint. Season with salt and pepper. Stir in 4 tablespoons of the olive oil and the egg. Stir well to combine. Fill the grooves in the zucchini evenly with the breadcrumb mixture. Drizzle a baking dish large enough to hold the zucchini in one layer with 2 tablespoons of the olive oil. 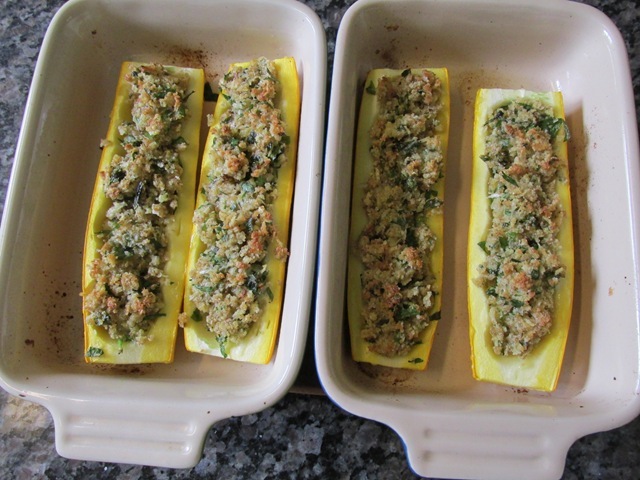 Arrange the zucchini in the dish side by side, stuffing side up. Drizzle the tops of the zucchini with ½ tablespoon olive oil. Cover the dish with aluminum foil and bake for 18 minutes. 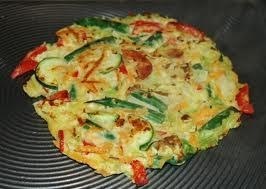 Uncover the dish and continue baking until the stuffing is crispy and the zucchini are tender, about 15 minutes. Remove from the oven and drizzle the tops with the final ½ tablespoon of olive oil. 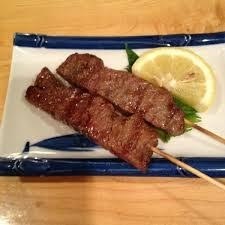 Let sit momentarily before serving. on August 17, 2015 at 8:35 pm | Reply Doris M.
You’re so lucky to have each other. 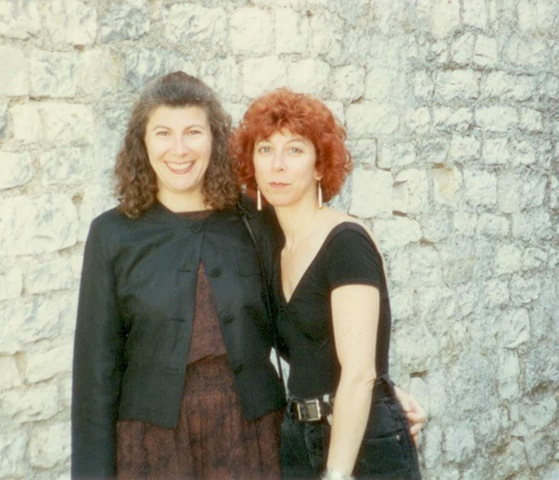 I always wanted a sister and even now at 86, I still miss one when I read your story. However, the restaurants you mentioned sound wonderful, and I’m going to try to visit them.